The Fellowes Quasar 130 Double Loop Wire Binding Machine is a stylish, user-friendly binding machine that can handle virtually any office application. The Quasar is designed for moderate use and is perfect for mid-sized office environments. This efficient machine can easily punch up to 15 sheets at a time and bind documents as large as 130 sheets with up to 9/16" 3:1 pitch wire. This machine includes a vertical document loading slot that helps to ensure accurate punch alignment every time. The Quasar 130 wire binding machine offers an efficient design that allows the user to punch and bind in a continuous manner for maximum productivity. Plus, it features a built-in storage tray with document measurement device for added convenience and quick set-up. Like most of the other Fellowes binding machines, the Quasar uses an adjustable rotary edge guide centers documents with ease. It also has a see-thru window to show when the waste drawer needs to be emptied and offers a space-saving design with carrying handle folds flat for easy storage. Plus, the machine includes a binding starter pack to help you get started in binding your documents. User-friendly machine combines excellent performance and features. Punches up to 15 sheets of paper at a time. Binds up to 130 sheets with a 9/16” wire. Allows user to punch & bind continuously for maximum productivity. Adjustable edge guide centers documents with ease. See-thru window shows when to empty waste drawer. Includes comb storage tray, document measurement tool, and binding starter pack (contents: 20 pk assorted kit). Have had this machine for about a month and it works great. Love that it folds up when not in use. It is a bit difficult to use but we don't bind a lot of documents so we make it work. This product does the job and looks clean every time. A slight learning curve at first, but once you get it down, it's easy to use. An added plus is that it's the nicest looking tool at my desk. Welcome to MyBinding video. 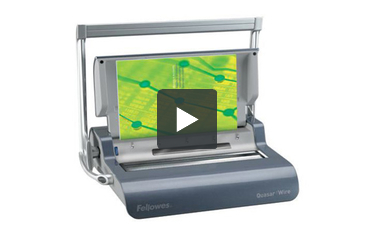 This is a demonstration video of the Quasar Wire, a manual wire binder by Fellowes. Simple, sleek, and compact, the Quasar Wire by Fellowes is a great wire binder. Let's watch it step-by-step in action. Lift the punch handle and the lid to go from stowaway to operational. Begin with the covers. Let's put the left side, the bind side, into the throat of the machine. Adjust the side margin control knob to the size paper you're using so that all punches will be consistent throughout your project and punch down. If you're satisfied with the results, continue on punching through the rest of the papers in your project. And now it's time for the binding. Assemble your project in order and select the right size wire bind for your book. Now, place the wire loops over the fence in the back. This holds it in place while you thread your project onto it. A little trick in wire binding is to take the back cover and flip it around so that it faces the front cover. This way the seam in the end will be hidden between the back cover and the back pages. Now that your book is in its new order, go ahead and thread it over the teeth of the wire bind, right through every hole. The Quasar Wire has a built-in wire closer. Twist the spine around so that the â€œC" faces down into the wire closer. Use the lever to close the closer and press the fence just as far as you need. There's a guide built-in that comes out as you close. Remove your project and you're done. And that's it. That's the Quasar Wire binding system by Fellowes. For more demos and reviews of this product and many more, check out MyBinding.com. Wire binding is one of the most popular document finishing methods around and with machines such as the Fellowes Quasar 130 Wire Binding Machine, it's easy to see why. This is a brand new product from the office supply titan and it's a pretty impressive one. It's designed beautifully, it's easy to use, and it comes with a lot of thoughtful features, such as a carrying handle. Unfortunately, it does have a couple of weaknesses as well, such as its lack of disengageable pins. Do this device's strengths outweigh its weaknesses? Continue reading to find out. The Quasar offers vertical punching of up to 15 sheets at a time. Vertical punching ensures that each punching job will be perfect. This device can bind booklets using spines that are up to 9/16" thick and have a 3.1 pitch. This means it can make books than contain up to 130 pages. The Quasar is a really nicely designed machine. It will fold up when not in use so you can easily store it away. It even has a handle so you can move it around without any trouble. The punching handle is U-shaped so anyone, right- or left-handed, can easily punch his/her documents. The design of this device supports continuous punching and binding so you can get your booklets bound a lot faster. There is an integrated storage tray for your wire spines. Also, the Quasar has a thickness measurement device so you can find out how thick your document is and then use the appropriate spine. Some of the other nice features include a chip tray window (so you can see if the tray needs emptying), a carrying handle, and a fully adjustable rotary edge guide so your document will be perfectly centered during the binding process. The Quasar measures 5.125" (height) x 18.125" (width) x 15.375" (depth), so it has a reasonably sized footprint. And as mentioned before, you can fold it up and store it when you don't need to have it out. Finally, this machine has a pretty generous 2-year warranty. A starter kit containing covers and spines is included so the machine can be used right away. The Quasar doesn't have disengageable pins, so binding special-sized documents will be either difficult or impossible. There is also no adjustable margin depth control, so users won't be able to control where their holes are punched. Also, the machine can only produce a 3:1 pitch pattern. The punching and binding capacities will be a concern for some people. While the 130-page length is adequate for a lot of documents, it's just not enough for others. If you'd like to create longer documents, you may want to take a look at the Fellowes lineup of Helios thermal binders. One of those devices can bind booklets that contain up to 600 pages. Although the punching lever is great for both left- and right-handed people, the wire-closing lever is located on the left side of the unit. Some people might having trouble using this part due to its location. Overall, the Fellowes Quasar 130's weaknesses are overshadowed by the machine's strengths, so long as you don't need disengageable pins and are at ease with the punching and binding capacities. This device would be a good choice for small or medium-sized offices that need a good-looking wire binder that's easy to operate and packed with some nice, thoughtful features. Does this punch round or rectangular holes? Thank you for your question. The Fellowes Quasar 130 Double Loop Wire Binding Machine punches rectangle holes. What are the wire spines that go with this machine and what sizes do you have? Thank you for your question. The Fellowes Quasar 130 Double Loop Wire Binding Machine uses 3:1 Twin Loop wire. 3:1 wire is available in sizes from 3/16" up to 9/16" .